Quality Auto Center is honored to present a wonderful example of pure vehicle design... this 2013 Audi S5 Premium Plus only has 51,449mi on it and could potentially be the vehicle of your dreams! You deserve a vehicle designed for higher expectations. This Audi S5 delivers with a luxurious, well-appointed interior and world-class engineering. Once you see this Audi, you'll quickly see that this is the perfect vehicle for the outdoor junky! You'll even feel relaxed knowing that this All-Wheel drive vehicle will get you to where you are going no matter what may come your way. Also, with this Audi S5's dependable control you'll be able to drive into the sunset without a care in the world! This vehicle has extremely low mileage on the odometer, so while it's pre-owned, it's practically new. Marked by excellent quality and features with unmistakable refined leather interior that added value and class to the Audi S5 More information about the 2013 Audi S5: The 2013 Audi A5 and S5 are a family of compact luxury coupes and convertibles. While the powertrains and some of the performance hardware is different between the two models, much of the same features are carried over, and they have essentially the same seating space and design--except Coupes have seating for five and Cabriolets can seat four. The A5 lineup offers a good alternative to the BMW 3-Series, Cadillac CTS Coupe, and INFINITI G37 Coupe, and especially in S4 form, it offers one of the best compromises between ride, comfort and performance of any of these models. And with the new Audi Connect system and revised MMI controller, and its live Google Earth maps, it has one of the best (and best-looking) infotainment systems. The top-performance RS5 Coupe can get to 60 mph in just 4.5 seconds, according to Audi. 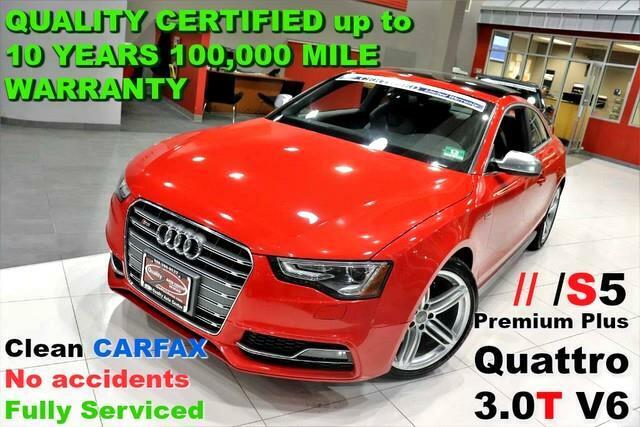 This model sets itself apart with Strong and responsive yet fuel-efficient powertrains, nicely proportioned exterior, advanced infotainment and connectivity, excellent quattro all-wheel drive system, great soft-top arrangement in the cabriolet, and stylish interior No Credit / Bad Credit / No Paystubs, No problem !! ! All Approved ! Everyone drives ! CLEAN, GORGEOUS, LOW MILES, SHOWROOM CONDITION. CALL NOW QUALITY CERTIFIED up to 10 YEARS 100,000 MILE WARRANTY , To Certify a vehicle, there will be an additional cost for Certification. CALL NOW For details. STUNNING AGGRESSIVE LOOK ON THIS BEAUTIFUL--Call today to schedule a test drive... Good Credit/Bad Credit/No problem!!!! Get paid cash? No problem!! 100% Credit Approval with interest rates starting at 2.49% for qualified customers, our rates will not be beaten. We price our cars at wholesale price to guarantee the best deals for our customers. Our inventory moves quick, please call to confirm the availability of the vehicle of your interest Springfield location 973-564-0112. This vehicle is located at our SPRINGFIELD location. Come visit our new showroom in Springfield NJ.